Reading for pleasure has taken a bit of a back seat in the last couple of months (see here for why) — so I’ve found myself drawn to comfort easy-reading. And for me Agatha Christie is the book equivalent of buttered crumpets and hot chocolate. Two things struck me afresh reading an Hercule Poirot novel that was new to me. First, the simple elegance of Christie’s style. Because I first fell in love with the books as a kid, they’d become associated in my mind with ‘childish things’ — yet they have a beguiling depth. And, secondly, how late does Poirot appear, how incidental is he to the plot, and how little is the character developed. Compared to today’s detective fiction, the ‘classic’ genre rarely felt the need to delve psychological depths. 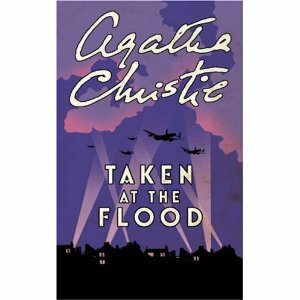 Taken at the Flood is rooted in the drab greyness of post-WWII, and features a newly demobbed and restless heroine, Lynn Marchmont, attracted to a scheming wrong ‘un over her steady-farmer fiance. Blackmail, suicide, murder and alibi hocus-pokery ensues. 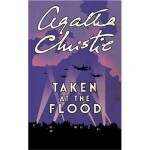 But, then, as so perversey often with Christie, the plot is actually rather beside the point.